The OECD Nuclear Energy Agency (NEA) is organising the Second International Workshop on Structural Materials for Innovative Nuclear Systems (SMINS-2). 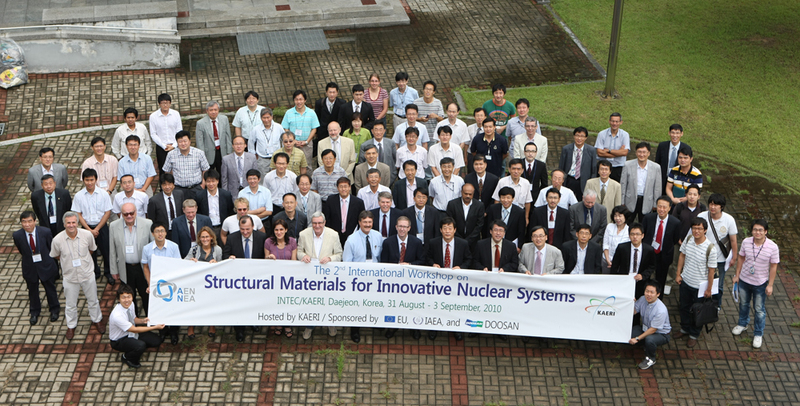 The workshop was held in Daejeon, Korea, from 31 August to 3 September 2010, hosted by the Korea Atomic Energy Research Institute (KAERI), and co-sponsored by the European Commission (EC) and the International Atomic Energy Agency (IAEA). Materials research is a field of growing relevance for innovative nuclear systems, such as Generation IV reactors, critical and sub-critical transmutation systems and fusion devices. For these different systems, structural materials are selected or developed taking into account the specificities of their foreseen operational environment. However, material development projects requiring both cross-cutting research programmes and advanced experimental/simulation facilities so as to characterise and evaluate the performance of the selected materials. This workshop aims at stimulating an exchange of information on current materials research programmes for different innovative nuclear systems with a view to identifying and developing potential synergies. The workshop covered fundamental studies, modelling and experiments on innovative structure materials including cladding materials for the range of advanced nuclear systems such as thermal/fast systems, sub-critical systems, as well as fusion systems. Fundamental studies should focus on multi-scale modelling, link between scales, numerical methods, limitation of displacement per atom (DPA) assessment, radiation damage, etc. Metallic and ceramic materials include in- and out-core applications taking into account the scopes of: data availability and gaps (considering also licensing issues); experimental and modelling needs for specific components or degradation modes; link between R&D, standardisation and experimental protocols; coolant effects and mechanical properties; etc. Novel materials pathways comprise nano-grained materials, grain boundary engineered materials, nano-precipitation strengthened materials and micro-laminates among other topics. It is noted that fuel-cladding interaction is not be covered in this edition of the workshop. Technical sessions were organised according to the four topics above mentioned. Summary session covered critical experiments, modelling needs and round robin opportunities. A poster session was organised on the second day (1 September 2010), covering all technical subjects. HANARO Research Reactor, KAERI, Daejeon (Thursday, 2 September 2010): HANARO (High-flux Advanced Neutron Application Reactor) is a high performance multipurpose research reactor based on its experience in the operation of previous reactors and accumulated nuclear technology. It is one of the largest scale national research facilities, in which nuclear technology of KAERI is crystallized to meet the future demand for various scientific and engineering researches. The visit will take one and half hour. More information is available at: http://hanaro.kaeri.re.kr/english/ and http://www.kaeri.re.kr/english/. Doosan Heavy Industries & Construction Co., Ltd., Changwon Plant (Friday, 3 September 2010): Doosan Heavy Industries & Construction Co., Ltd., (DHIC) is a major player in the nuclear power plant business as a leading supplier of Korean nuclear equipments (including reactor vessels, steam generators, pressurisers and primary piping etc.). Changwon plant is the Mecca of Korean machine industry. On its 1,100 acres of land, there are fifteen large factories and research centres including the nuclear, turbine and generator shops. The visit will take one day. More information is available at: http://www.doosanheavy.com/eng/ and brochure. To attend technical tours, please register by sending the completed registration form to local organiser (smins2@kaeri.re.kr or jypark@kaeri.re.kr) no later than 15 August 2010.